Thinking of ways to spruce up your cooking space? A kitchen backsplash is an affordable and fun way to add a whole new look to one of the most important rooms throughout your entire home. Backsplash colors, textures, and designs can impact the entire style of your kitchen, creating an eye-popping detail that adds a more modern, country, rustic, or any style you prefer, feel to your space. 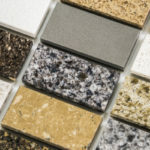 You can go with recycled glass tiles, bricks, marble, granite and more! The right detailing for you kitchen backsplash will depend on the theme, colors, and materials that are already used throughout your kitchen. Here we take a look at 7 different kitchen backsplash ideas that will enhance any kitchen remodel for an affordable touch of detailed luxury. Plus, we reveal the number one rule when finding the right materials for your kitchen backsplash. This is one of our favorite ideas for a unique appearance that gets people asking questions about the materials used to craft such a look. You start off by painting the back of a single sheet of glass. You then have this glass installed over your backsplash for an incredibly contemporary appeal. The glass gives off a shinny, reflective appearance highlighted by whatever color you paint on the backside. Plus, the glass is easy to clean all of the oils from the stovetop, and the color beneath the glass remains preserved. Bricks traditionally come in shades of red, but they can also be painted to match any color in your kitchen. Just keep in mind that once you paint brick you can never fully restore its original color. The bricks you select can create a look that is country and classic, or modern and sleek. Thick white planks of horizontal wood can make for a very classic, clean, and Victorian-era appearance when added to a backsplash. Even if you have all white cabinets, and countertops, you can never have too much white these days in your kitchen. Your backsplash can be big or small, but in comparison to your cabinets, counters, and flooring the backsplash takes up a relatively small space. For this reason, it’s often the spot people feel brave enough to incorporate bright pops of color. If your kitchen is mostly one color, or lacks any bright splashes, the backsplash can be a good spot to add a dash of red, yellow, teal, or any color you like most. A big trend in home design right now is black and white elements. Adding black and white tiles to your backsplash looks very clean and sleek. Depending on the size of the tiles you can play with the overall design some too. Small white and black tiles can offer a retro feel, while larger tile patterns can look more modern. If you decide to use a montage of black and white tiles to create your backsplash, make sure you pick tiles that are of appropriate size to match with the rest of your kitchen décor. Marble backsplashes are incredibly beautiful and can make your kitchen suddenly look like a 5-star hotel. Marble comes in different colors, which gives you some variety to choose from. For a more modern look, the same marble can be carried over to the counter tops or other elements in your kitchen. Adding tiles that have distinct or intricate patterns on them is a great way to add character to your kitchen. Detailed tiles used over an entire space can start to look a bit busy, so you might want to simplify other details near the tiles. Although, for country kitchens it’s all about the crowded appeal, which makes detailed tiles an excellent option for you backsplash. Your kitchen backsplash doesn’t have to be small, nor does it have to be large. You can pick the exact area that it encompasses, according to your style preference, budget, and current kitchen layout. Backsplashes can be one color or they can be many different colors, they can be sleek and flat, or rough and full of complicated texture. 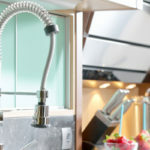 There are few elements of your kitchen that come in such variety as the backsplash, for this reason it can start to feel like there are no rules when creating a backsplash design. Before you pick the right materials for the job, there is one important rule to keep in consideration. 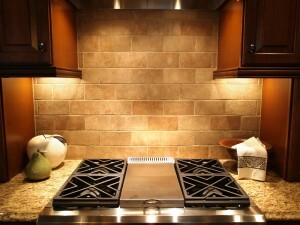 Your backsplash is usually located just behind the stovetop, where many oils seep up while you cook. Overtime debris will start to cling and build up on your backsplash, and depending on the materials used can create some issues. 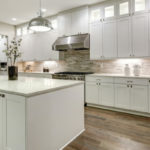 That’s why the most important rule to follow for kitchen backsplashes is to find a material that is able to withstand this exposure, and is also easy to clean. 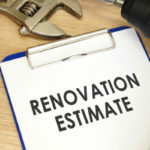 Interested in remodeling your kitchen? Tops Kitchen Cabinet offers wholesale prices on the latest trends for all of your remodeling needs!